On Friday, October 17th, Council Member Gale A. Brewer (D-Manhattan), Chair of the Technology in Government Committee, held a hearing regarding the City’s interest for a unique .nyc Top Level Domain (TLD). The Internet Corporation for Assigned Names and Numbers, also known as ICANN, is globally recognized not-for-profit that is responsible for the coordination of domain names worldwide. In the 2009, ICANN will be implementing new policy recommendations to expand domains for cities worldwide, in an effort to boost city identities and tourism. The new TLD process that is being introduced by ICANN will issue TLDs to cities for the first time in 2009. After this date, cities will be able to apply for a top level domain, eg. .nyc for New York. This TLD will continue New York’s dominance in commerce, tourism, and culture. Moreover, these efforts will increase New York City's position as a leading Digital City. Council Member Gale A. 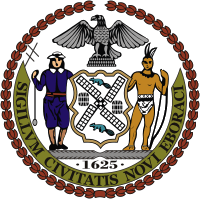 Brewer is sponsoring a resolution to support the acquisition of the .nyc Top Level Domain. Resolution 1495-2008 urges The Internet Corporation for Assigned Names and Numbers (ICANN) to approve the City’s application in order to meet the needs of city residents via the Internet.